Does The Gym Master Heavy Duty Exercise Bike Offer The Professional Performance Expected? The Gym Master Heavy Duty Exercise Bike definitely looks like a desirable, modern spinning bike and with its 18kg flywheel, heavy-duty tubing, a console that measures the usual data and plenty of other features it should perform like one too. There are high hopes of any product that markets itself as a “semi-commercial professional gym spin bike” – not only does it have to live up to the standard set at the gym, it needs to be user-friendly for the home. Does this example deliver? Can The GYM MASTER Fitness Bike Provide High Quality, A Tough Workout And Accessibility? This product is now discontinued. You can find newer model here. 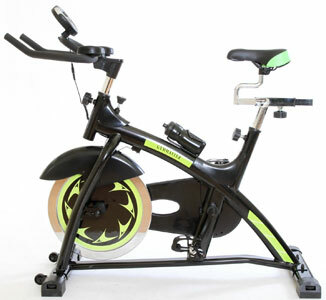 The sharp angles, bright green accents and slim figure of the GYM MASTER Fitness Bike make it look like a top of the line exercise machine for a tough workout but it actually promises to be kind and helpful to users of all abilities. The use of the 18kg flywheel means that Gym Master can promise fluidity in the movement of the bike for an effective and low impact workout: is this ease of use and accessibility what buyers have been experiencing or is it still too much of a high end model?